BlSinful Colors is a nail polish brand that only a few years ago most hadn’t encountered. Now it is popping up quite a bit and a lot of people ask me about it. Personally, I find mine at Walgreens for $1.99, but I know other similar stores carry them. I find that these are much better quality than most cheaper polishes. One thing to keep in mind is that these polishes don’t appear to be thick and if you only want opaque polishes, these will usually take at least 3 coats. If you like the glitz and glamour but don’t want to buy OPI or China Glaze, these are great to try out. You might find you like or dislike certain colors and not everywhere will take them back!!! Keep in mind, I have applied more than one coat of each, which I will detail below. These are my top 5 most used Sinful Colors. What are some of yours? 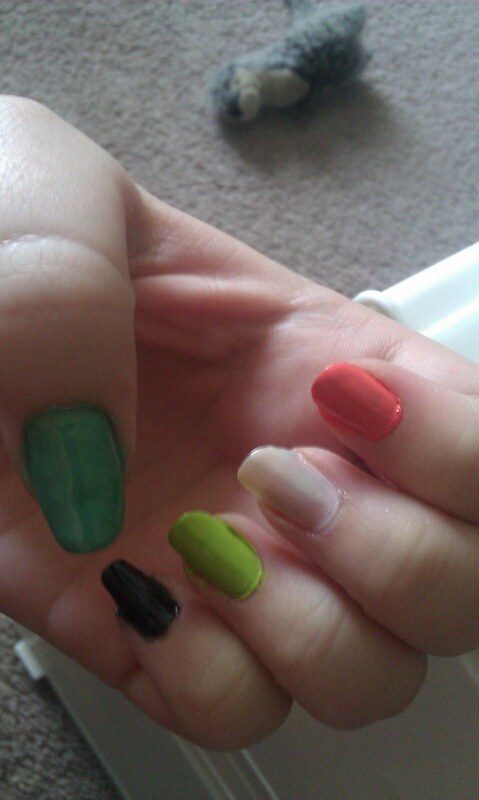 All from Sinful Colors, colors in order from pinkie to thumb. Each has no top or base coat. 2 heavy coats each. 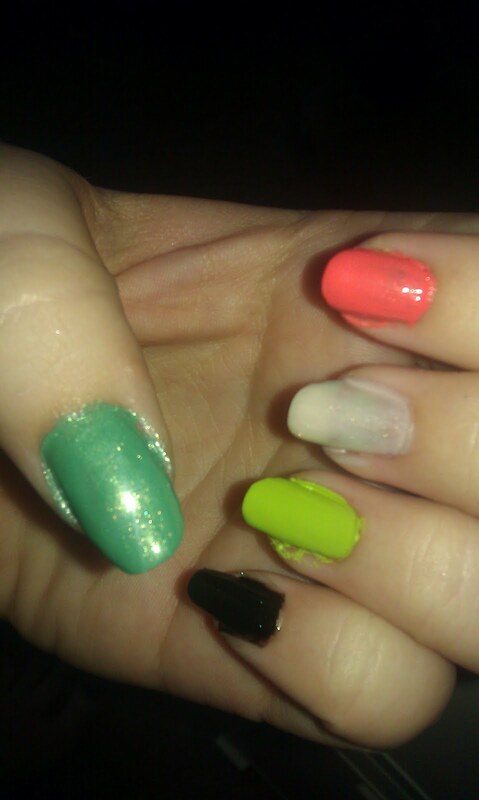 Innocent, Social Ladder, Hazard, & Mint Apple. With Flash. Mint Apple (thumb) is a beautiful muted teal with a golden shimmer. It is subtle and easy to apply. Hazard (pointer) is a coral I use very often. No shimmer, dries with a shine, and is wonderful for summer. Social Ladder (middle) is a great all around neutral. In the bottle it looks pink than on the nails. It shines pink, purple, blue, and green but in a VERY muted way. I have worn it to weddings. Innocent (ring) is my favorite lime green. It is extremely easy to apply and fills in all my ridges smoothly. No shimmer. What’s Your Name (pinkie) is very hard to photograph. I love it. It is black with micro blue glitter. If you used to rock black nail polish in your younger years, this is the perfect way to gracefully move from the harshness to something with an undertone. Looks thin, but goes on surprising well to make a nice clean manicure. If you have any questions let me know! What are some of YOUR favorites? I’d love to hear them!!! NOTE: I have not received any kind of payment for any of my references or reviews.